To Annabelle Klein, the rules laid down by the Magicians are the mere ramblings of stuffy old men. As far as she’s concerned, the historic Iconoclasts, heretics who nearly destroyed the Magicians so long ago, are nothing but a myth. She has much more important matters to worry about. I went into reading Colorless with no expectations. I liked what I read the blurb. You have Gods who people fear, Magicians, and the mysterious Iconoclasts. What is there not to like? Well, I was right to like what I read in the blurb. This book was fantastic. It took me 3 hours to read Colorless. The author did something that usually doesn’t work in YA fantasy. She took all the information about the Gods, the Magicians, the monks, and the Iconoclasts and doled it out in bits. That would have bugged me normally. I am that type of reader that needs everything upfront. But in this case, it worked. I didn’t get information overload and I was able to process what I read in time for more information to be dropped. I do wish a little more world building was used when describing the land that Annabelle lived. While there is history, it is only mentioned in passing. I would have loved to know why the Gods were feared instead of loved. I would love to know how the Magicians came to rule. I would also loved to have known why the monks were the way they were. And finally, I would love to know why the Magicians feared the Iconoclasts so much. Some of what I wrote was touched upon in the book but not explained. I have a feeling that more will be explained in book 2. Let’s talk about the monks for a minute. They were the creepiest things in the whole book. When they were first mentioned, I thought that maybe it was a coincidence that they spoke like they had one mind. But, as I got deeper into the book, the more I realized it wasn’t the case. They actually reminded me of ants with the way they acted and looked. I mean they had multifaceted eyes. Screams bug to me. I liked Annabelle. She was your typical teenage girl until she was told her parents were killed. Then she lost all color and people forgot that she existed. She became a shadow in her own home. She was a very strong person to deal with that isolation. The only things that saw her were her horse. Her journey to finding out what happened to her parents became one to save herself and her cousin Tony. I would not have been able to deal with what she went through. The only people who could see her was Dylan, his brothers,, their grandmother, Sophie and Faust, a family friend. But there was a secret that Annabelle didn’t know about, one that could kill her. I liked Dylan too and I was surprised that he could see Annabelle at first. The more the story was written from his perspective, the more I could see that there was something going on with Sophie. What was going on with Sophie 100% connected to Dylan being able to see Annabelle? Eventually, it also was connected about why Annabelle color molted. The end of the book was fantastic. A lot of my questions were answered in a very satisfactory way but a lot weren’t. While some plot lines were wrapped up, others won’t. I am very interested to see where Tony’s plotline will go. I am also very interested in seeing where Annabelle and Dylan’s plotline will go and if a romance will come out of it. 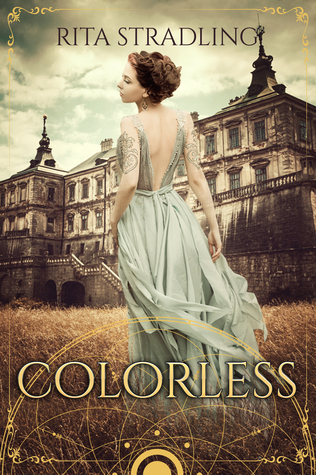 Colorless is a fast-paced YA fantasy. This book became a favorite of mine while reading it. With richly written characters and a world where I could imagine myself being in, I couldn’t get enough of it. I am looking forward to reading book 2 in this series. I am also looking forward to seeing if the author does more world building and expands Annabelle’s universe.